Oval Double Halo Engagement Ring in 14k Two-Tone Gold | Shane Co.
Seventy-six round diamonds, at approximately .63 carat total weight line the top and sides of this magnificent oval double halo engagement ring crafted from quality 14 karat white gold and rose gold. 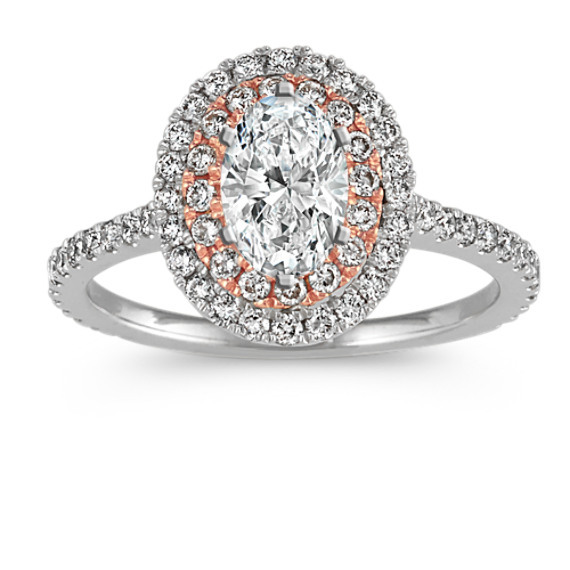 The center oval gemstone of your choice at approximately 1.00 carat will look divine in this brilliant pavé setting. The ring is 12.5mm at the center and 1.5mm at the band. I absouletly love this ring! I experienced a wonderful Thanksgiving this year. My boyfriend asked me to marry him and presented me with this gorgeous ring. It’s absolutely stunning...that hint of rose gold! It’s such a beautiful ring and I can’t stop staring at it! Thank you for offering excellent quality rings that don’t look like what everyone else has. I’m so happy to have a unique ring that is perfect for me. I have always heard wonderful things about your store, service and rings, so happy he chose ShaneCo.